So how can you stop your company being fined? The summer has seen a several large fines for companies who’ve made compliance mistakes – with fines reaching hundreds of millions or more. These fines are hugely costly both in the money that has to be paid and the knock-on damage to the brand. But how does a compliance department stop such things happening? Your company may be doing something illegal, and some employees may know it’s illegal but many may just think they are helping your revenue or profits, not realizing that mistakes are being made. You want your employees to be “happy to help”, but only if it’s legal. We note that, where staff understanding has not been tested, it is hard for firms to judge how well the relevant training has been absorbed. Once personnel have been trained on a particular subject, a compliance officer should periodically assess employees on their knowledge and comprehension of the subject matter. Is online assessment a magic bullet that will stop all compliance mistakes and future fines? No. But if used well, it can pinpoint regulatory failings before they become serious and check your employees know and retain knowledge of the rules. 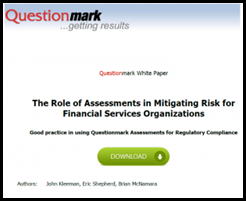 For more information on how assessments can help, check out Questionmark’s white paper on The Role of Assessments in Mitigating Risk for Financial Services Organizations (free with registration). Although focused on financial services, much of the paper also makes sense in other industries. Very often, the vast majority of the company is compliant with regulations, but there is a problem in just one area. Online assessments are one of the few tools available that allow a compliance department and senior management to touch and get response from every one of their employees. Providing you implement online assessment well (set up tests that cover the full range of regulatory liabilities, make sure that the testing procedures are reliable and trustable, and look at the reports and take action when you need to), then online assessments can substantially reduce the risk that your organization will break the rules and pay a fine.